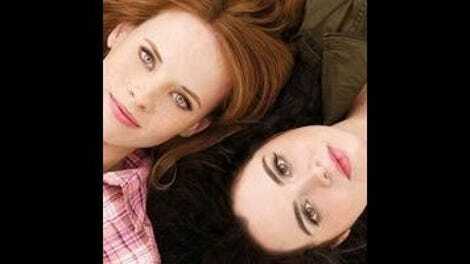 Switched At Birth has always been better at setting finales up than knocking them down. This is mostly because the show shines when dealing with the subtleties of interpersonal relationships, while its finales are always more plot-driven affairs. The show seems to be learning from its own mistakes, giving “Introducing The Miracle” a far better balance between plot and emotion, and the episode is much stronger for it. There was a lot of plot to wrap up after last week’s powerful all-ASL episode, and for the most part, this finale handles it with ease. The one plot that does seem to move a bit swiftly considering its importance is the resolution of the student occupation of Carlton. It starts out promising, picking up where last week’s episode left off with the cops at Carlton’s door. A petrified Daphne steps out of the school and states her demands, which are not accepted and lead to the students being dragged out of the school by police in front of a crowd of reporters. Between the press and the dedication of the students, the school board decides to reconsider its position on closing Carlton, but it won’t accept all the student demands: They want the school to be comprised of half hearing, half deaf students, and those hearing students won’t be forced to learn ASL or sign. It’s a half-victory, but one Daphne and her fellow students decide to accept so they can keep their school. Everyone except Travis, that is. The handling of Travis’ character has been one of the best arcs of the second season, and it continues here as he resists the school board’s decision and chooses to drop out instead. His instinct to give up when things get tough is the exact opposite of Daphne’s character, and that tension makes their friendship a really interesting one. When Daphne confronts him and tells him they’ve been through too much together to not see everything through to the end, it’s a small scene but you can feel all their past this season screaming in the subtext, and it’s pretty great to watch. In the end, he chooses to return and to continue his fight for himself and for his future. It’s a great button on the Carlton arc for the season, an arc that looks likely to continue as more hearing kids are integrated into the school in the future. But the best thing about the Carlton arc continues to be Bay and Daphne and the highs and lows of their increasingly sister-like relationship. The tension of their bond after the occupation is palpable, a tension that only increases when Emmett tells Bay about Noah’s potential interest in Daphne as more than friends. When Noah admits to as much (in a mature, shockingly honest way), Bay seems ripe to write Daphne off for good. That is, until Regina relapses and the two of them come together as true sisters to help their mother. It’s a touching moment, and one I hope helps their bond recover as their growing familial bond is one of the best threads on the show. In the mean time, those were some fantastic sister fights, weren’t they? And oh, dear Regina. 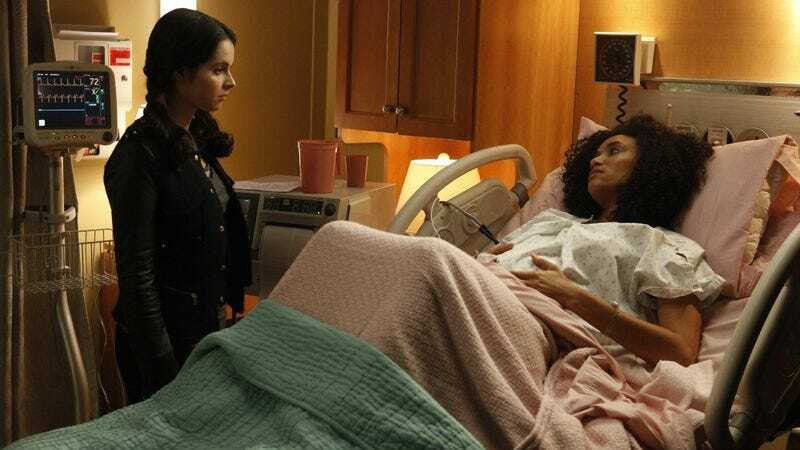 Two plots this season seemed like pure unnecessary soap—this one and Angelo’s new baby—but Regina’s slip back into alcoholism turned into something much more along the way. Instead of a little slip easily solved in an episode’s span, the show really delved into the lies and delusions an alcoholic uses to fuel their addiction, and how those lies affect the people around them. In particular, Regina’s slip devastated her daughters and their trust in her, as she lied to them both repeatedly. Sure, Angelo swooped in and saved the day here, setting Regina up at a rehab in Minnesota. But the damage to Bay and Daphne is done, as illustrated in the devastating scene where Daphne apologizes for pushing Regina away and contributing to her problem. Kudos to the show and to the actors for telling a sensitive story from what started out as something potentially less. Though there was more emotional content in this finale than in previous ones, the soapy plot machinations were definitely still there. The biggest example of this is Toby’s sudden engagement to Nikki, something that happens completely off-camera and out of the blue. It’s more than a little bit crazy, especially when Toby learns he likely got into college and blows it off for his engagement. It’s set up very hastily—other than a lovely speech from Toby about his feelings for Nikki—and obviously will be a big story in the episodes going forward. Here, it felt shoehorned in, something soapy that took time away from the more resonant stories. Also providing some soap was Switched At Birth’s most reliable soap generator, Angelo. Lana has the baby and seems very conflicted about raising the baby with Angelo. Instead of sticking around to either give the baby up for adoption or raise it herself, she instead leaves the hospital with the baby and doesn’t tell Angelo where she’s going. It’s mostly pure soapy nonsense, but one thing redeems it: Bay, and her reaction to seeing Angelo with the baby. Although Bay was raised by wonderful parents in Kathryn and John, she never got to have that same relationship with Angelo and Regina, and seeing Angelo cradling his new daughter breaks something inside of Bay I’m not sure she even knew was there to break. The show smartly doesn’t get in the way, simply showing the heartbreak on Bay’s face and then following that heartbreak up with a touching conversation between Bay and Kathryn. For all the strides the families have made together since the switch, there are still so many raw nerves like this, just waiting for the right moments to be exposed. Although this finale wasn’t perfect, it was a lovely way to end this first stretch of very strong season two episodes. My first thought as the episode ended was concern over having to wait until summer to see what happens next. If that’s not the sign of a successful season of television, I’m not sure what is. Carrie Wikis Some Art: Introducing The Miracle, Paul Klee, 1916, Gouache, pen, and ink on plastered fabric, mounted on board. John’s opponent withdrawing from the race is an appropriately anti-climactic end to the election story, but it did lead to a nice scene between Kathryn and John as she encourages him to get excited about his new position. I really like Noah, flaws and all. His forthright answer to Bay’s question about Daphne was startling but great. Zane’s going on tour? Bye, Zane. You were a very attractive plot point.